There being sixteen years between babies, I had forgotten a lot. Right after I adopted my younger children a couple years ago I began to remember. I remembered that I can’t even take a shower without peace, let alone get an hour of Bible Study prayer and journaling that I was used to. Here are 7 ideas for spending time with God. 1. Have Scripture emailed to you. For many years I read through the Bible on a reading plan. Here are some plans that get emailed to you. You can chose to read the whole Bible through the year, but I’d recommend starting with the New Testament first. Also, if you get behind, don’t let the emails pile up. Delete the old ones and get back on track. It’s about reading God’s Word and spending time with Jesus … no guilt allowed! 2. Keep a Bible open on the kitchen counter. Yes, it might acquire spaghetti sauce stains, but I don’t think Jesus will mind. If it’s there and open you can read God’s Word and whisper thoughts and prayers to Him as the bread is toasting or the pasta is boiling. God’s ears are attuned to kitchen prayers just as much as ones whispered on your knees in a quiet morning. 3. Watch Christian sermons on YouTube. Some of my favorites are videos of Francis Chan and Beth Moore. They are wonderful teachers who bring God’s Word to life! I’ve pulled them up on my computer while I’m folding clothes instead of turning on TV shows–much more uplifting! 4. Keep a devotional book in your bathroom. One of my favorites is Nothing is Impossible by Women of Faith. I’ve discovered I can read a devotion and meditate on the Bible Scripture verse it in the time it takes to blow dry my hair. 5. 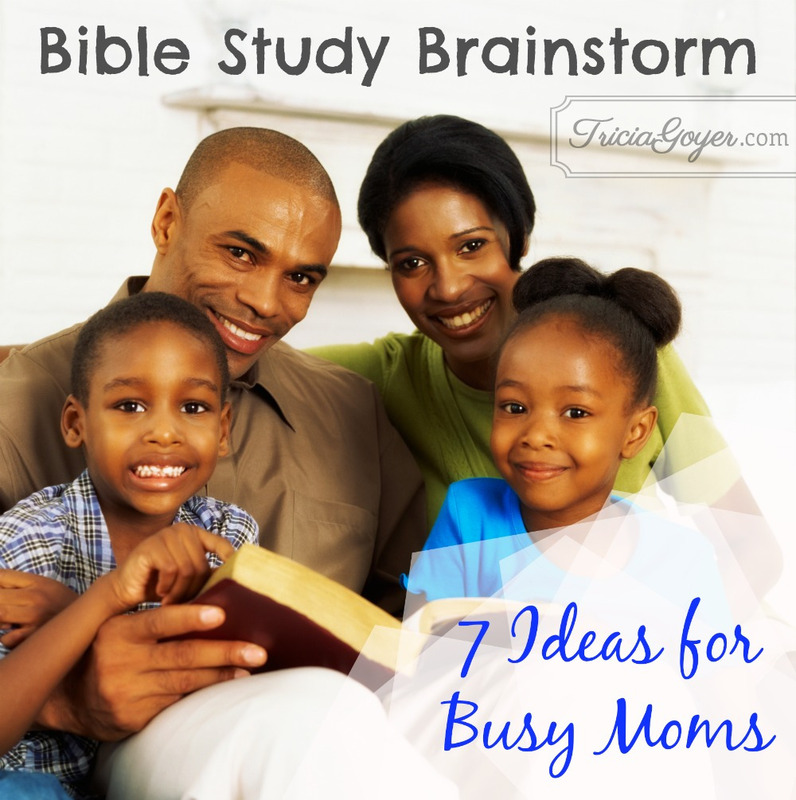 Have a Bible Study time with your kids. For years I used Keys for Kids. It’s online and it’s FREE. The best part is the kids loved it and they kept me accountable! 6. 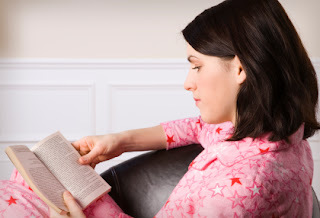 Ask your husband to be your Bible reading partner. Many years ago John and I started reading the Bible together before he goes to work. We read though the Bible, but we don’t try to stick to a Bible reading plan. (Tried that and it just stressed us out!) Instead, we just keep a bookmark in the Bible and pick up where we left off last time. We each take a turn reading a chapter out loud if we have time. If not we split a chapter and each read half. We don’t stress if we can’t get it in, but we enjoy it when we do. It also gives us great topics of conversation throughout the day. 7. Join a Bible Study. I know, I know this can be a challenge, but it can also be a great joy. In the past, I’ve joined Bible Study Fellowship. They provide great studies and have an amazing children’s program. Not only do the moms get to hear God’s Word, but the children do too. There is weekly homework that takes 15-20 minutes a day on average. I fit this in by waking up earlier than normal or by asking my husband to watch the kids for a few minutes. It’s hard for him to say no when I tell him I need to study the Bible! If you’re looking for an online study, check out Good Morning Girls. Good Morning Girls exists to inspire, encourage and equip women all over the world to get into God’s Word through their online community. Good Morning Girls has multiple online Bible studies, resources and videos created with YOU in mind and all for FREE! Those are some things I’ve done. Now … what about you? What are your favorite ways to study the Bible?